2 Pianos, 4 Hands. Composed by Franz Joseph Haydn (1732-1809). Edited by Horst Walter. Sheet music. Henle Music Folios. Pages: IV and 46. Classical. Piano Reduction. 50 pages. G. Henle #HN640. Published by G. Henle (HL.51480640). In contrast to Mozart, Haydn was not a keyboard virtuoso. He certainly conducted his orchestra works from the harpsichord, and also performed his own piano sonatas, but any ambition to be a concertizing pianist was foreign to his nature. 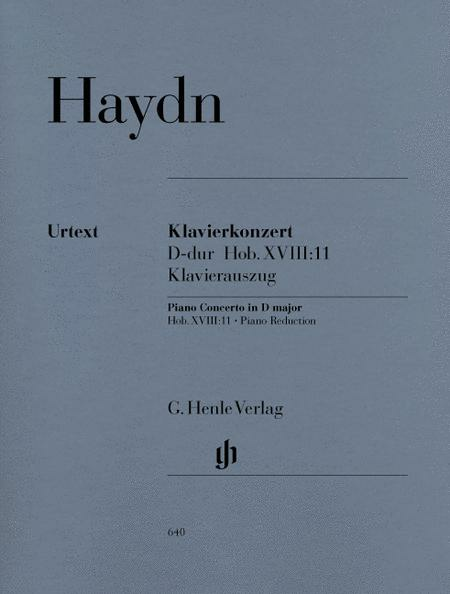 Thus “only” three piano concertos by Haydn have come down to us. Owing to its catchy, fresh melodies, its harmonic nuances and its clear classical concerto architecture, the Concerto for piano and orchestra in D Major Hob. XVIII is the most frequently played. In spit of its high profile we know neither the occasion for which it was written nor the year of its composition. The preface to our piano reduction edition deals with these questions in detail. 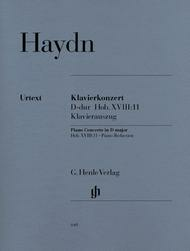 The edition is based on the musical text of the Haydn Complete Edition, which is likewise published G. Henle Publishers.